The RV world is loaded with several types and styles of recreational vehicles. From million-dollar luxurious coaches to cheaper options, like the simple pop up camper. The pop up camper is simple, but it’s long been a popular option for many families looking to hit the road. Let’s look at the pop up camper including its pros and cons to help you decide if it’s the right recreational vehicle for your adventures on and off the road. The most obvious quality of the pop up camper is its ability to “pop up." The pop up camper collapses into a compact and lightweight trailer while on the road or in storage. There are brands of campers available from simple hookups to ones outfitted with amenities you’d find in larger trailers. It will be your call to decide what kind of pop up camper is right for you. The pop up camper holds several unique advantages in the RV world. Besides space, you’ll be saving on gas mileage and may not have to invest in a towing vehicle to travel. 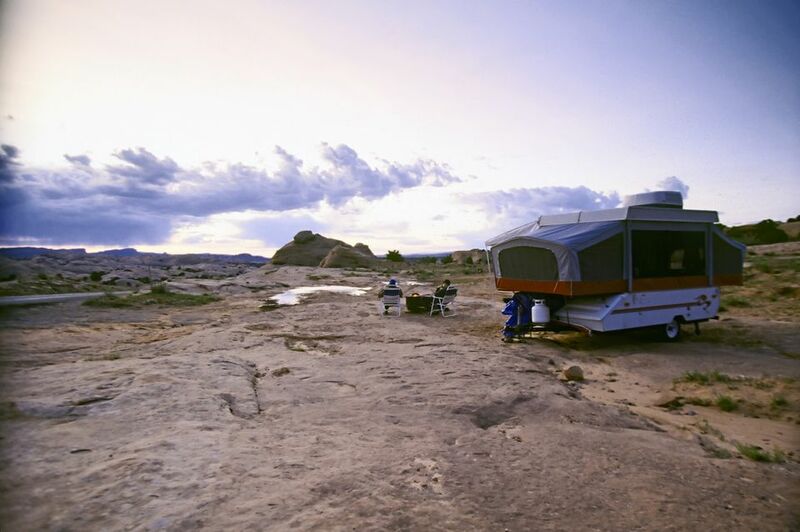 Pop up campers can often be towed by small trucks, SUVs, and even compact cars. Economical: The pop up camper is one of the cheapest options in the world of RVs. You can get sleeping space for several people, kitchenettes and entertainment options for a lower price tag. If you are hesitant about getting into the world of RVing due to cost, you should consider the pop up. Lightweight and Compact: Another reason for the popularity of pop up campers comes in their unique design. Most pop up campers are compact and lightweight while on the road and in storage. This means you won't worry about a large coach wasting space or the hazards that come with towing a large trailer. Towing: Even rookie RVers can handle towing a pop up camper after a few trips. This small amount of weight also means you should get great fuel economy which means less time at the pump. You won’t have to buy an upgraded towing vehicle. Most pop up campers are towed by lighter trucks, SUVs, even minivans and standard size cars. Some of the pop up camper’s cons can lead to some disadvantages, too. A pop up camper is a gateway RV for those looking to invest in one but who aren’t ready to buy a fifth wheel RV, travel trailer, or motorhome because of the budget. Amenities and Features: The pop up camper’s compact size can be its downfall if you’re looking for more room and features. If it can’t fold up into a small size, you can’t have it in a pop up camper. Some nice features found in travel trailers or motorhomes won’t be available when buying a pop up camper. Comfort: Once again, compromises are needed to afford the pop up its compactness. Sleeping quarters in pop up campers are protected by a vinyl covering. Extreme temperatures and adverse weather will affect the pop up camper more than other RVs. Sleeping quarters on pop ups tend to be stiff as well so you’ll need more toppers for added comfort. Customization Options: Pop up campers often can’t be added to down the line, leaving you little in the way of adding functionality in the future. When buying a pop up camper, it’s important to ensure it comes with everything you need for adventure. The pop up camper is a great RVing option for those looking to hit the road on a budget. Talk with friends and families who have pop up campers such as visiting RV forums to find out more. When you’re out and about, noticing a pop up camper on the road, talk to the owner and see why they invested in one. Even the local dealer can help determine if a pop up camper is right for you.